There’s a special reason I’ve saved the Japanese post till last. Almost since we met, Dr HH and I have been fantasising about our dream trip to Japan, but every time we consider it we get cold feet because of how stupidly expensive everything is. But this time we have fully committed to going there next summer (we’ve booked our flights already! )…and devouring this Japanese feast at Itadaki Zen in London really got me in the mood for more planning/daydreaming about this distant adventure. I’d already been to this little restaurant near King’s Cross once before, and had always been waiting for a chance to return. In July I persuaded an omni friend to join me, and I believe we were both impressed with what we got. I got the same as last time: the tempura set. 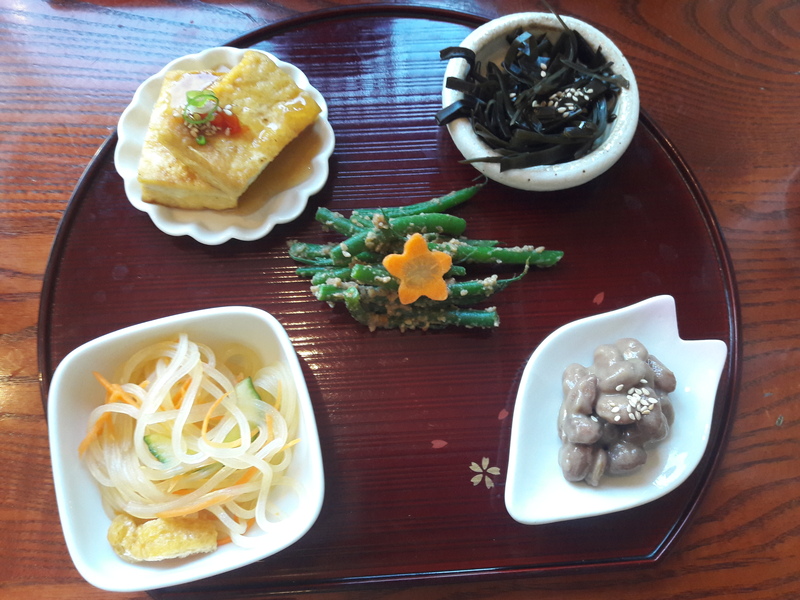 It started with these five little vegetable dishes: noodles, seaweed, beans in some greyish sauce, and the real highlights of peanutty green beans, and delicious tofu. I love getting to try lots of little dishes like this, there were a lot of fun things going on. 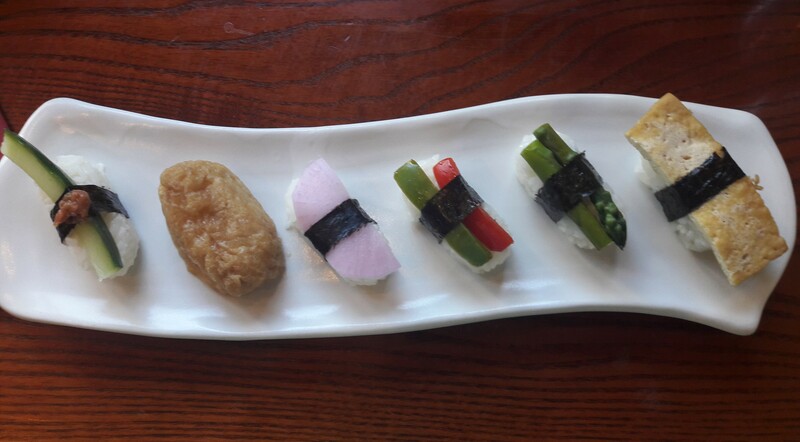 This was followed by six pieces of sushi: inari (the little tofu pocket, which is always my favourite), and others topped with cucumber and a weird tangy sauce, asparagus, pepper, and tofu. Whenever I’m served sushi I think I’m getting a light dish, but of course, it always turns out to be surprisingly hearty, and this was no exception. And so when I got to the tempura stage of the tempura set, I was already too full to go on! I think I managed one or two in the restaurant, and got the rest to takeaway. Anyway, I can report that they were crisp, oily, and delicious. There was some potato and broccoli, amongst other less exciting veg, and some with bits of seaweed in them. Perhaps it was just the seaweed, but they were really salty too (which was a good thing, in my opinion). Unsurprisingly, I also had to get my dessert to takeaway. There was a choice of desserts, and I went for the chocolate and berry cheesecake. 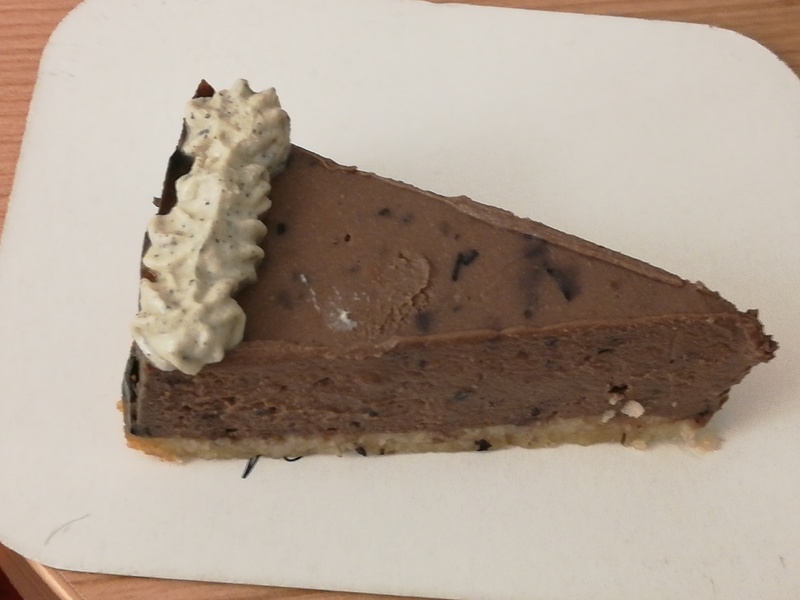 I let Dr HH take care of this back in our hotel, and he reported that though there was a non-biscuity base it was still a good cheesecake, quite rich and chocolatey. My friend went for the noddle set, which kicked off with the three starters above (the same as three of the ones I had, and also involved the same six pieces of sushi. 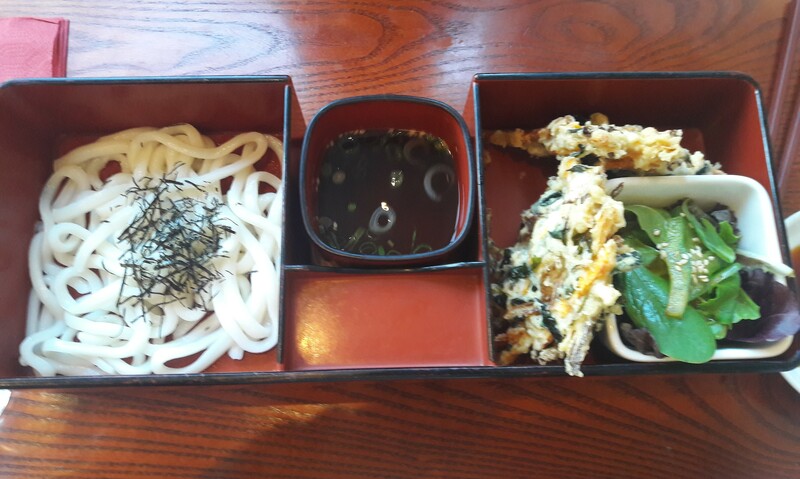 For her main, she got a couple of pieces of tempura the same as me, and some plain noodles. While she raved about the tempura, she found the noodles to be a bit of a disappointment. Overall though, exciting Japanese fare all round! 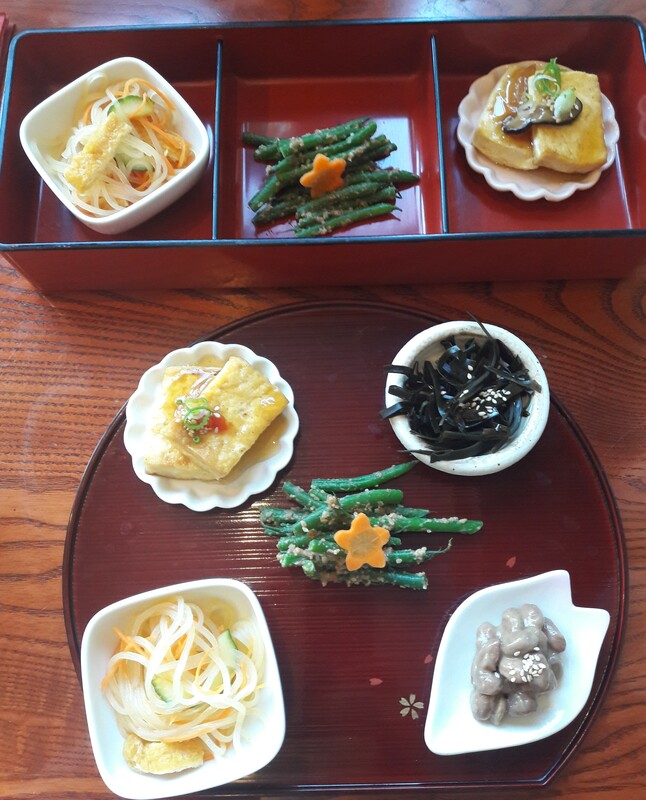 And so it seems apt to finish this year’s VeganMoFo with Japanese cuisine, because I’m already planning that next year’s theme will be my trip to Japan! Hopefully this is just a taste of all the delicious things to come! Thank you to everyone who has read/liked/commented – it means a lot to me. I hope you’ve all enjoyed VeganMoFo 2018 as much as I have! There were times when I didn’t think I’d be able to find thirty different cuisines, but the fact that I managed it says a lot about the current vegan scene and how amazing it is. What was your favourite of the thirty cuisines I’ve tried for VeganMoFo? And do you have any tips for my big trip to Japan next summer? This entry was posted in Travel, Vegan Mofo and tagged Itadaki Zen London, vegan travel, veganmofo18. Bookmark the permalink. Nice review. We’ve been wanting to go to Itadiki Zen a couple of times now (as it’s close to St Pancras – where the Eurostar arrives), but always had back with the opning hours when we were in that area. Hopefully on our next trip to London. I’ve missed out a few times because of the opening hours too – hope you manage to work it out next time! 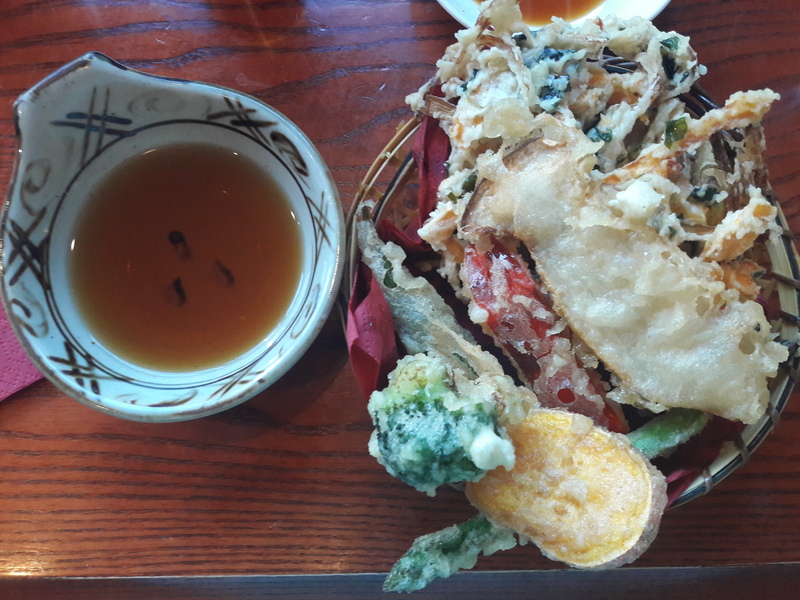 Looks like an impressive spread; the tempura veggies sound great! How exciting about your planned trip to Japan; I hope you have a wonderful time! And congrats on an awesome Vegan MoFo; your theme was so fun! I haven’t been there for a few years, there’s so many new places popping up its difficult to get round to the old ones again and it’s not an area I’m in very often. Must try harder! That’s the best kind of vegan problem to have though!